Previewed at: The Reel Room, Sydney, on 16 October 2017. 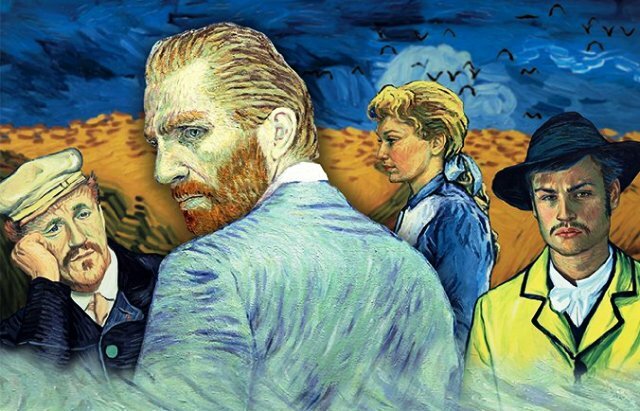 Loving Vincent is the world’s first fully painted feature film and it’s both an animated bio-pic and a whoddunit that attempts to unravel the mystery surrounding the death of the 19th century Dutch painter Vincent van Gogh. It asks whether the great artist’s demise was caused by misadventure or suicide. We know he was volatile and had famously cut off one of his ears, but did he die from shooting himself in the stomach or was someone else responsible for pulling the trigger? In a most unusual way, the directors Dorota Kobiela and Hugh Welchman have created a journey of discovery to try and unearth the truth by presenting the evidence for the audience to ponder. The story was first shot as a live-action film with actors chosen for their resemblance to the characters they portray (which we know from van Gogh’s portraits); then each frame was carefully hand-painted in oils by 125 artists, creating 65,000 paintings in the style of the Dutch master. Not long after van Gogh’s (Robert Gulaczyk) death, a postmaster (Chris O’Dowd) sends his wayward son Armand (Douglas Booth) to Paris to deliver a letter to Vincent’s brother, Theo (Cezary Lukaszewicz). There he learns from Vincent’s paint supplier Pere Tanguy (John Sessions) that Theo, too, has passed away. Tanguy also tells him that, at the time of his death, Vincent was poised on the brink of success. Armand becomes intrigued, wondering why someone would choose such a moment to end their life, so continues his travels in an attempt to find out exactly what happened. His journey takes him to Auvers-sur-Oise, an hour outside of Paris, where the artist spent the last 10 weeks of his life, and where Armand finds more intrigue and unanswered questions and gets involved with the village residents who knew Vincent. A meeting with the enigmatic Dr. Gachet (Jerome Flynn), his housekeeper Louise Chevalier (Helen McCrory) and the Doctor’s daughter, Marguerite (Saoirse Ronan), only add to the mystery and soon his questions embroil him in a clash with the local gendarmes - not helped by his predilection for absinthe! Loving Vincent is a fascinating UK/Polish collaboration that involved hundreds of artists and crew working in three studios in two countries. Bringing all that together is a credit to the co-directors, Poland’s Dorota Kobiela and the UK’s Hugh Welchman. Van Gogh’s paintings were never fully recognised in his lifetime and yet they are considered the genesis of modernism for their unique style, so it’s important to try and understand the man. Apart from the secrets being pursued in the script, which are intriguing in themselves, the pictorial representation of the paintings is absolutely riveting and a must-see, not only for lovers of the master’s work but for anyone interested in this unique style of animation. One thing’s for certain, you’ll never look at a van Gogh painting in the same way again!